Laughing and shielding their eyes from the sun, a group of Summer Institute (SI) participants casually tossed a Frisbee to one another out on Rosenthal Field. Meanwhile, in the upper school gym, another group of students playing volleyball couldn’t help but notice the delicious aroma from the nearby kitchen where a cooking class was underway. From backyard games held on the field to volleyball boot camp and “cooking corner” in the gym and kitchen, SI students this year are enjoying brand-new specialty class period offerings. It’s all part of Harker’s increasingly popular Summer Institute program, now up and running on the Saratoga campus. Open to both Harker students and the general public in grades 6-12, the institute got underway on June 17 and runs until Aug. 9. Holding a plate of freshly-made scrambled eggs in her cooking class, Romina Parimi, a grade 6 student at San Jose’s Challenger Berryessa School, called it her favorite special activity so far. As a non-Harker student and first-time participant to SI, she said she was impressed by how beautiful the upper school campus is. “The academics are good; the activities are good!” she enthused. The unique specialty classes are available via SI’s afternoon activity program (A.P.) where many middle school-aged students like Parimi sign up for courses, which change weekly. In addition to outdoor games, volleyball and cooking, other rotating class options include art, jewelry-making, magic, improv, dance, tech, junior lifeguard, chess and circus arts. SI has two separate tracks, one designed for middle schoolers and another geared toward upper school-aged students. 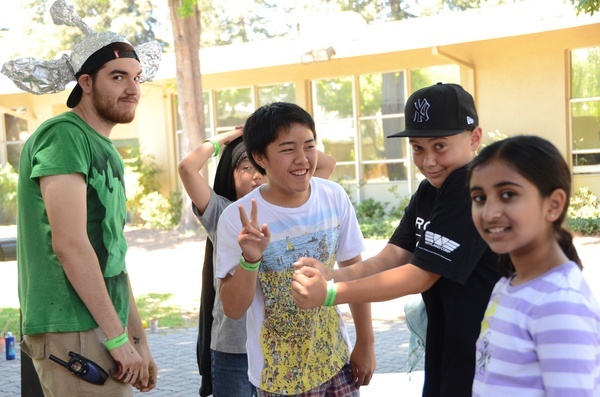 All SI participants typically combine a morning academic program with afternoon activities, allowing them to earn credits and learn new skills, yet still have plenty of time left over for summertime fun. The institute’s academic portion offers rigorous for-credit courses such as algebra, economics and programming, as well as non-credit opportunities for enrichment and growth like creative writing, Web design, debate and robotics. A driver’s education course is available for students aged 15 and up. For middle school aged participants (grades 6-8) A.P. provides many options for specialty classes and recreational activities. Weekly sessions are divided by themes, such as superhero, western, fantasy, Harry Potter, Disney and animation. There are also off-campus field trips every couple of weeks to such hot spots as the shoreline, the Tech Museum and Capitola. “The wide range of choices and flexibility allows each student to design a schedule around his or her own academic needs and personal interests,” explained Keith Hirota, summer middle school director. Grade 9 students have the option to either participate in A.P. or join the older high school students who have no organized afternoon activity program but enjoy free, drop-in access to the library, pool, art room, Ping-Pong table, basketball courts and study spaces. For all grades, an on-site prepared lunch is included. According to Hirota, a total of 920 middle and upper school students are enrolled in this summer’s overall SI program, of which 550 participants are non-Harker students. He added that an average of 80-85 students per week attend A.P., with about 50 of those individuals coming from the general public.